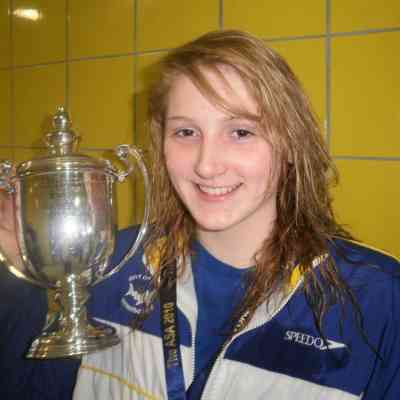 City of Leeds’ tri­umph in last month’s Junior League Final makes the front cov­er of December’s Swim­ming Times Magazine. City of Leeds A Team qual­i­fy for the Are­na League Nation­al Final after an emphat­ic vic­to­ry in the North East League Final. Yes­ter­day, City of Leeds stomped to vic­to­ry in the Are­na Junior Inter-League Final for the first time in their history. 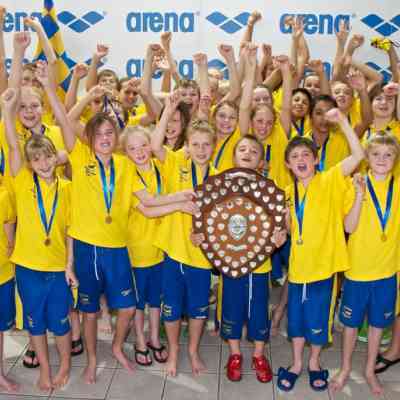 City of Leeds’ strength in depth shines through in the sec­ond round of the North East Are­na Swim­ming League. 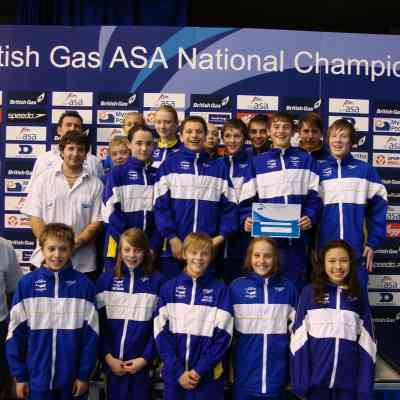 City of Leeds’ BAC­GAT Swim­mers in par­tic­u­lar, dom­i­nate pro­ceed­ings at short course NER Cham­pi­onships in Sunderland. Liam Bir­rell and Kiani Camp­bell-Grady come away with five and four golds respec­tive­ly as Leeds enjoy suc­cess in first cham­pi­onship event of the season. City of Leeds tri­umphant­ly reignite Are­na League cam­paign after a five year hiatus. After a dis­ap­point­ing 200m indi­vid­ual med­ley ear­li­er in the week, Anne Bochmann clocked a two sec­ond life-time best today to fin­ish 4th in the 400m freestyle at the Com­mon­wealth Games in Delhi. Despite it being ear­ly in the sea­son there were some fan­tas­tic per­for­mances from City of Leeds Swim­mers. The atmos­phere on pool­side was excel­lent and many swim­mers achieved best times. Sun­day saw the City of Leeds over­come strong oppo­si­tion to be crowned North­ern League Cham­pi­ons and will now progress to the Nation­al Final in November. 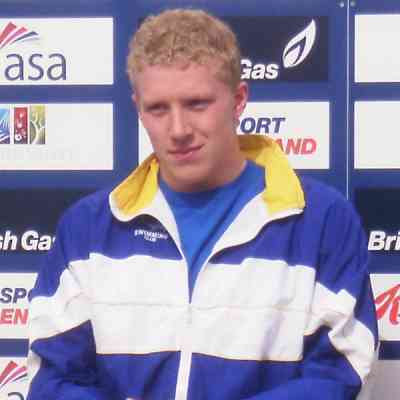 Rep­re­sent­ing Scot­land in the French Open Water Cup this week­end, Stephen Water­house beat a strong inter­na­tion­al con­tin­gent to com­plete the dou­ble in both the 5k and 10k events. A mag­nif­i­cent dou­ble vic­to­ry by both ​‘A’ & ​‘B’ teams in the White Rose League meets held at Aquat­ics Cen­tre, JCCS. The ASA Nation­al Cham­pi­onships in Sun­der­land saw a first senior inter­na­tion­al qual­i­fi­ca­tion for Bochmann and a first senior medal for Kiritschenko. Lots of life time best per­for­mances help bring home the women’s team tro­phy for the sec­ond year run­ning with the club fin­ish­ing sec­ond top team overall. Five days of great per­for­mances from every swim­mer con­tributed to the team win­ning the Nation­al Age Group Team Cham­pi­onship title for the sec­ond time in three years. A fan­tas­tic achieve­ment for all involved. Con­grat­u­la­tions to Gor­don Ben­son who a won the SUSO 13 – 17 years High Per­for­mance Draft­ing Triathlon (400m Swim, 10km Bike, 2.5km Run) at Eton Dor­ney Lake on Saturday. Con­grat­u­la­tions to all swim­mers who com­pet­ed at NER BAG­CATS over the week­end. There were some fan­tas­tic per­for­mances that result­ed in 21 Medals, 63 Finals Swims as well as Life Time Bests and Nation­al Qual­i­fy­ing times. A belat­ed con­grat­u­la­tions to Emma Gra­ham, who on the 8th May com­pet­ed in the 10k at the LEN Open Water Cup in Eilat, Israel. Fin­ish­ing as the high­est placed junior in 6th place, and only 2 min­utes behind Olympic Cham­pi­on Ker­ri-Anne Payne, she secured selec­tion for the 14th FINA World Cham­pi­onships in Canada! 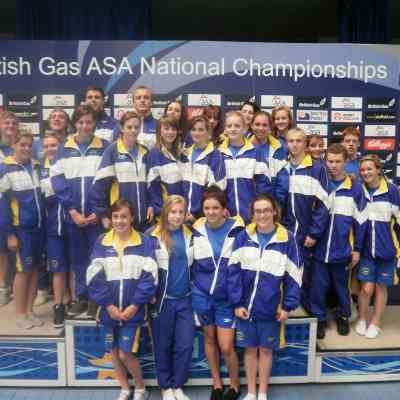 After a thrilling week­end, City of Leeds regained the top senior team tro­phy at the British Gas spon­sored York­shire SA Senior/​Junior Cham­pi­onships at the Aquat­ics Cen­tre, JCCS.